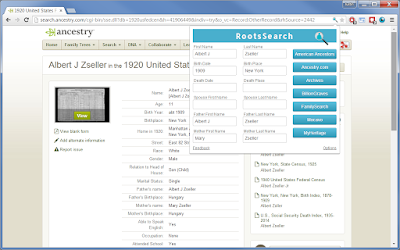 RootsSearch began in July 2012 as a small set of enhancements to the FamilySearch Family Tree. I was doing a lot of genealogy research and was frustrated by the need to constantly copy and paste information for record searches. It quickly grew into a dedicated search utility and was named RootsSearch with the help of friends from RootsDev. 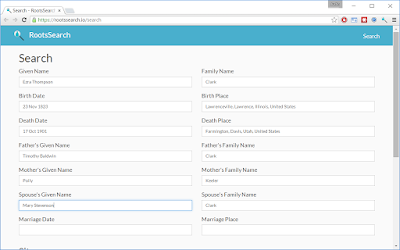 RootsSearch detected person information on genealogy websites. It would then display the RootsSearch logo in the right side of the address bar next to the bookmark star icon. When the RootsSearch icon was clicked, a popup would appear that contained the information we found (names, dates, and places) as well as links to search for related records on genealogy websites. The RootsSearch popup with information from a 1920 US Census record on Ancestry. The size of the popup is limited, therefore we quickly ran out of room for adding websites to search. In 2013 we released an options page that allowed each user to choose which websites were available for searching. Our vision for RootsSearch continued to expand it became obvious that the popup was too limiting. Therefore at the beginning of this month, September 2015, we released the RootsSearch website and updated the Chrome extension to send users to the website for searching. The website gives us the room and control that we need for adding new features. The first new feature that the website allows is actually an unintended consequence: searching without using the Chrome extension. This means you can search without having to find a specific person in your online tree first. This isn't a common situation but it's still nice to have the functionality. The first major new feature we plan on releasing is a browser extension for Firefox. This is our most requested feature and should be fairly straightforward now that the RootsSearch website has been released. After releasing the Firefox extension we'll likely tackle the large task of detecting multiple assertions for a given piece of information. 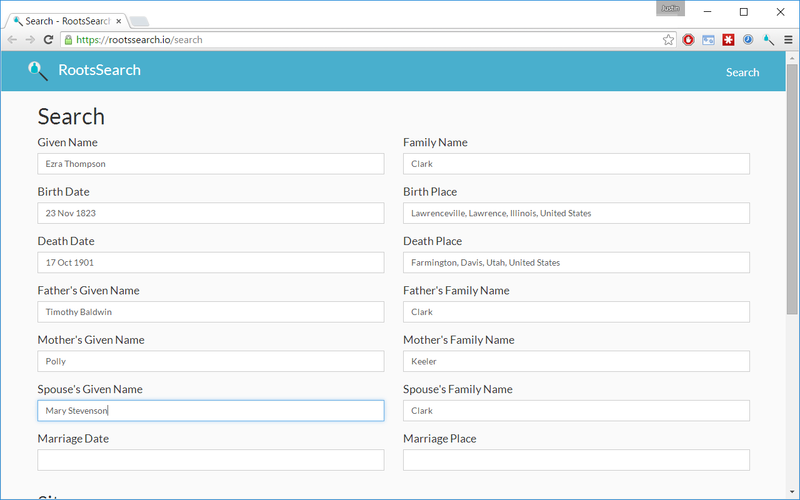 For example, multiple names, multiple dates, or multiple places. Our long-term vision is to RootsSearch into a research log where you can automatically save and analyze information from sources you find before saving the information in your tree. Maybe we'll even help you with that last step of pushing the information into your tree. Do these new features sound exciting or useful to you? What else you would you like to see added to RootsSearch? We remind you that RootsSearch is a side project. Delivery of new features will be slow. There's also no guarantee that any features will ever be delivered. But we've maintained development for three years and we don't plan on stopping now. I'm looking forward to the Firefox extension. As a computer professional, I prefer Firefox for the extension support and control.